This is a different sort of CD on Lithops in that it is distributed as an e-book on CD-ROM. The format is Microsoft Word, so you will need a computer which can read this format and display high quality images to benefit from the work. The publication is sub-titled, 'A practical guide for the successful windowsill grower', which is accurate as this is aimed very much at the grower rather than those interested in names and taxonomy. 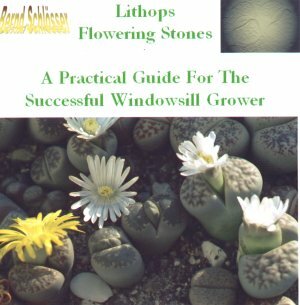 It is packed full of useful tips and snippets of information and will be extremely useful to the novice grower or those who are having trouble growing Lithops. The publication has 70 pages of text and includes 107 colour photographs. The latter are are sharp and accurate in colour and many have an attractive 3D quality bringing out the surface texture which is so important in many Lithops species. The text has been translated into fluent English by Hans Hassberg. The only indication of the original german is a few of the captions on some of the line drawings. Why an e-book rather than a printed version which would be availble to everyone? The answer is in the cost, the CD is available for a very modest 10 GBP (15 Euro); if printed it would probably be two to three times as expensive. Bernd Schlösser can be contacted at lithops@tiscalimail.de or Borkzeile 10, 13583 Berlin, Germany.